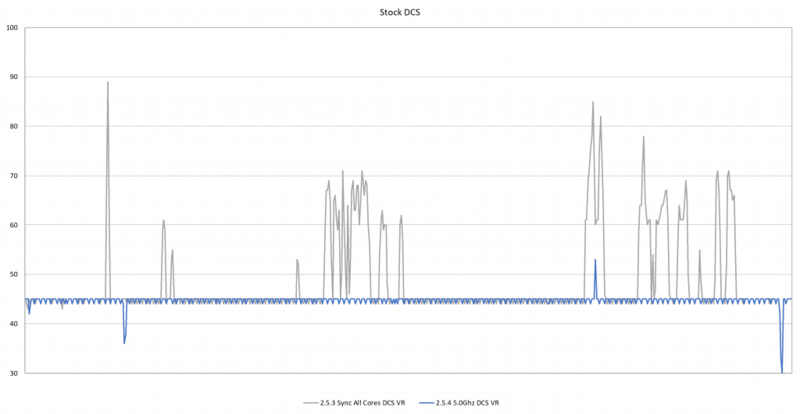 In late Nov. 2018 I’ve done an extensive test to figure out the effect of Over Clocking the CPU on DCS performance. You can all read it here. That test was done on a mid October Open-beta 2.5.3.22877, since then a few updates had came and improved visibility in VR. 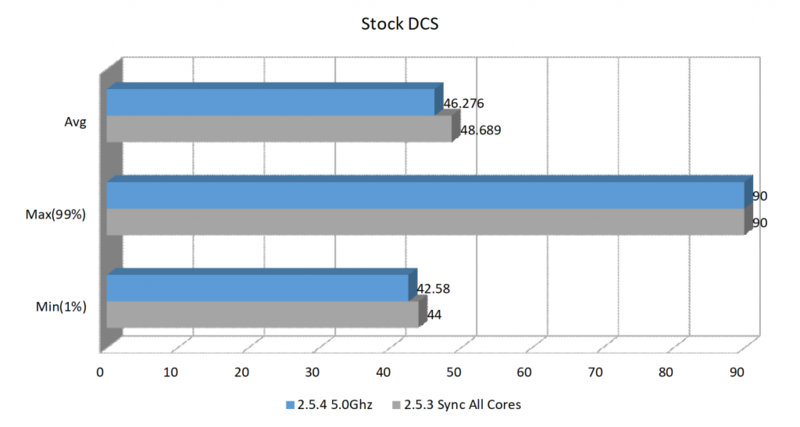 However, there where some claims of performance improvements. People around the ED forums speak wildly about great results. So I took Dec. 20th 2018 2.5.4.25729 Open-Beta for a quick VR benchmark. 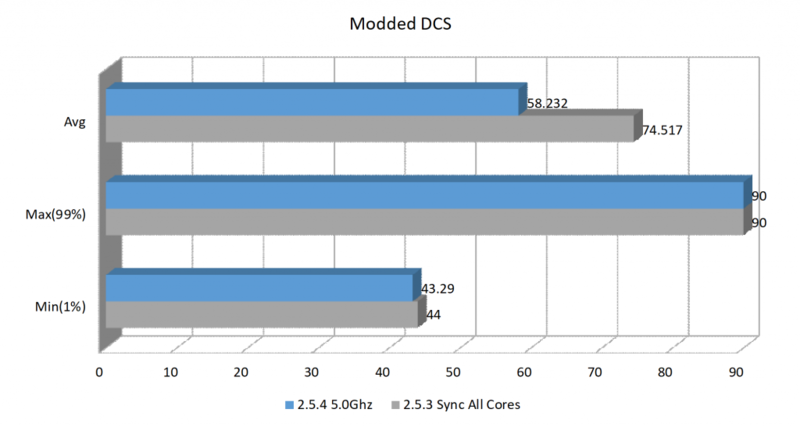 First the rig specs, Unchanged from previous test except for normal Win10, Mod and DCS. System has Dual Graphics card for multiple screens cockpit. 1080 is used for graphics in game. second card only does 2d stuff and video encoding. Displays Full screen: 4K monitor (on 1080 Via DisplayPort). VR: HTC Vive, (HDMI to GTX1080. (System has 5 screens connected on all tests. 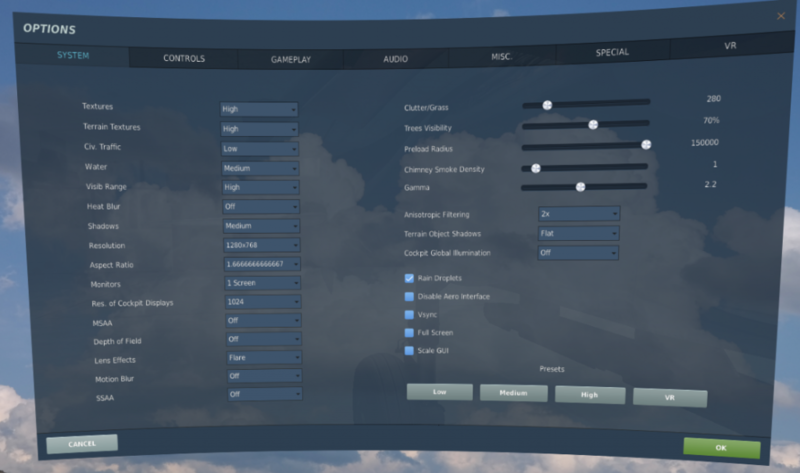 DCS and steam VR settings remained the same. then two runs of a DCS SU-25T track in Caucasus theater. one run with stock DCS and a second run with Kegetys’ shader mod. FPS data was gathered over the 10 minute replay with FRAPS, recording avarage FPS for every second. SteamVR was used (HTC VIVE) set to Async Reprojection, thus allowing framerate to be floating between 45 and 90 rather then sticking to one or the other. Now after all this formalities, here are the somewhat puzzling results. 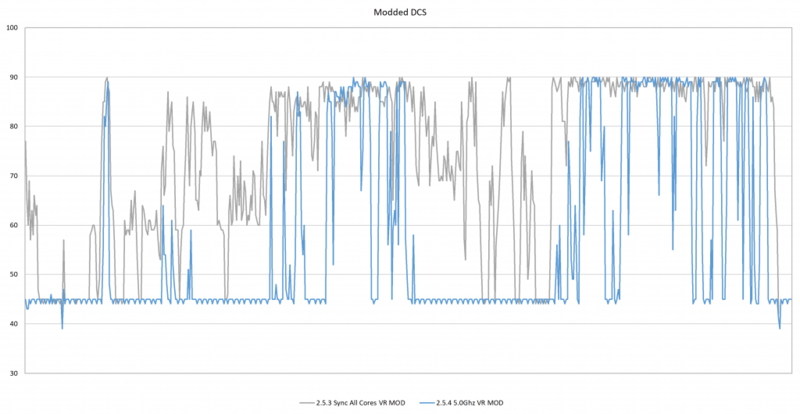 Based on the previous results, I’m actually running a very modest 5.0Ghz on all cores. I’ve decided I’ll compare it to “boost all cores” results, which are 4.7Ghz OC. despite all that, these results are a direct contradiction to all the fanboys claimed performance wise. there were changes to visual detection and model rendering, I saw them very clearly, but performance… See for yourself. starting from straight numbers. we can see a drop in avarage FPS. more so on the modded version. looking more into the FPS plots, it seems that FPS are more stable at 45 fps on stock, which is wierd, because nothing has changed in my SteamVR Async settings. Modded also less tending to go up above 45 compared to 2.5.4. Looking at a very simple, single player track for an empty free flight performance of 2.5.4 is clearly inferior to 2.5.3.
this however does not test heavier, MP based, multi-object scenarios.